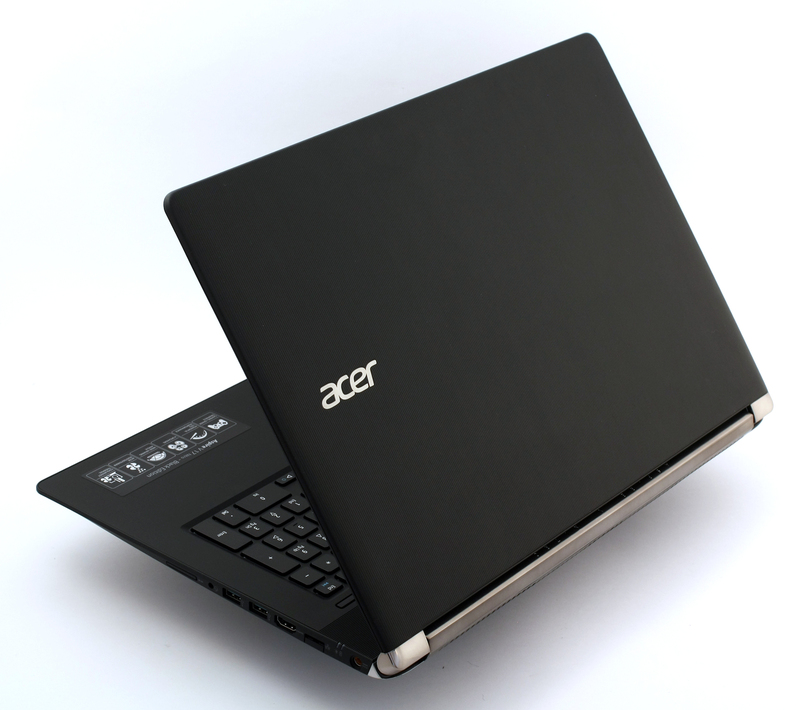 When Acer outed the Aspire V15 Nitro Black Edition notebook it became a hit really quickly and why not? 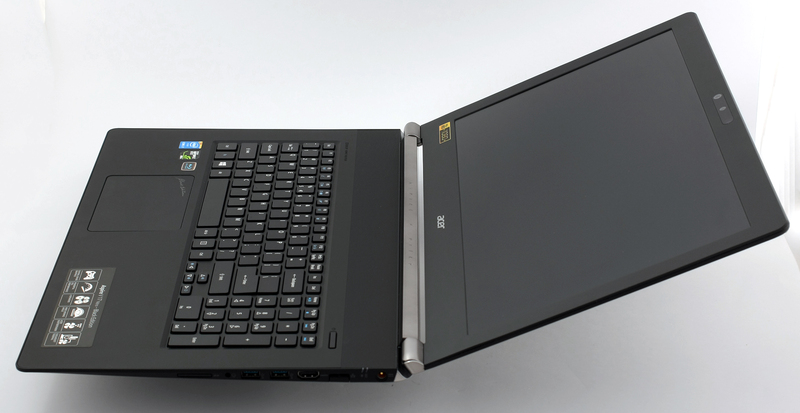 This laptop has some great looks, it’s thin, it’s light and has some serious power under the hood. However, this is not the subject of our review today – it’s Acer Aspire V17 Nitro Black Edition or we can easily say its bigger brother. If you are searching for a bigger screen or just a bigger form factor, but you still want the features of the 15-incher, the Aspire VN-791G is the way to go. This big boy keeps the same design signature as the 15-incher with some minor changes. Spec-wise, the notebook is absolutely the same and, to be honest, this isn’t as good as you think. In order to present a 17-inch variant of the best gaming notebook from the company you have to add some more features or at least bump up some of the specs so the consumer will have a reason to buy the bigger version. Here, we have only bigger screen and nothing more. The keyboard looks a bit bigger, though and it’s still easy and comfortable to use. At least we can expect some better cooling due to the bigger chassis as it will provide better airflow. The Aspire V17 Nitro that we’ve got is a testing unit and it is possible that some of the accessories will be missing. Nevertheless, we don’t expect to be different from the 15-inch variant and will most probably have a DVD with drivers, AC charger and cable along with the usual user manuals. 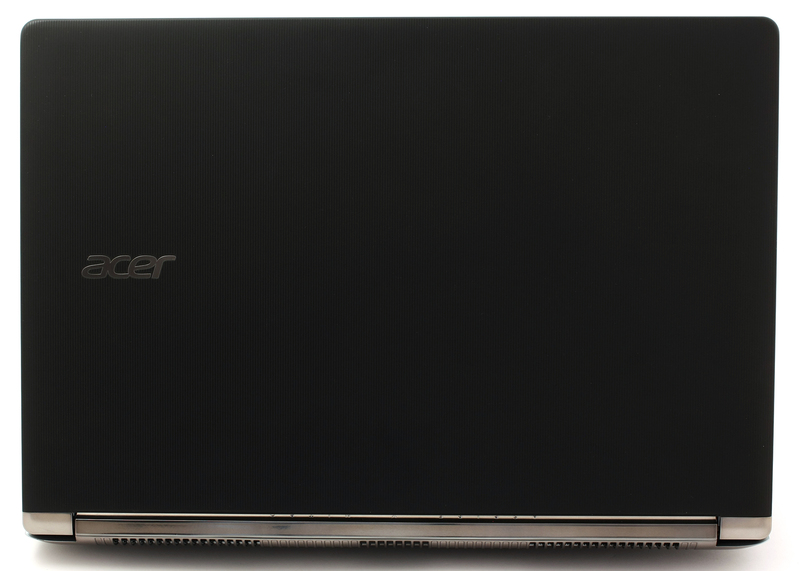 The chassis of the Aspire V17 Nitro is almost identical to the 15-inch model and has the same build quality. We’ve got an aluminum inner frame with the rubberized matte finish on top and as Acer likes to call this combination “Soft touch NIL” or Nanoimprint Lithography. Those fancy words actually mean that the engineers managed to fuse together the soft-touch plastic and the aluminum on a molecular level. This way the chassis will keep its useful heat dispersing properties, which the aluminum has to offer, and have a good soft grip on the outside with the rubberized finish. The top lid features the so-called NIL material with straight lines for ornaments. You can also see the Acer logo placed at the usual spot. The bottom of the lid is attached to two hinges, which are made of plastic, but strongly resemble an aluminum piece. We also noticed that it’s really easy to bend the lid as it is too big and it’s supported by two hinges that are placed apart. This problem did not occur when we tested the 15-inch variant, whatsoever. 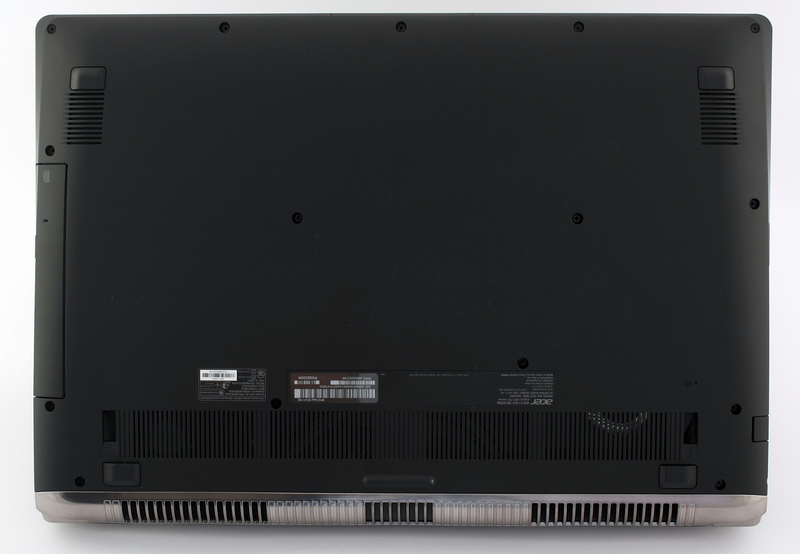 The back of the laptop uses the same plastic, or should we say “aluminum-like” piece, for the main heat dispersing grills. Moving on with the bottom piece which is covered in the same soft-touch plastic and has a big grill that can be used for an external cooling pad for some extra airflow. You will also find the two loudspeakers on each side and if you place your notebook on a soft surface, the sound will come out muffled. Aspire V17 Nitro carries on the legacy of the incredibly thin profile, despite the fact that this version is a tad thicker than the original. To be more specific, the 15-inch version has a 23.25 mm profile, while the 17-inch variant measures at 25.4 mm. Unfortunately, while this machine carries the good “genes” of its little brother, it also has its drawbacks and we are talking about the impractical port placement. Almost all connectivity options and ports are placed on the right side of the machine. If you are using most of the ports, or even all of them, there will be a lot of cables getting in your way when working with an external mouse. The right side accommodates the DC charging port, LAN, 2x USB 3.0, the 3.5 mm jack for headphones, and the SD card reader. On the left, you will find 2x USB 2.0 ports and the Blu-ray optical drive. The interior, however, hasn’t been changed at all, except for the engraved lines right above the keyboard. It looks like Acer didn’t know what to do with all that free space and the plastic used for the interior is still a fingerprint magnet. The keyboard is the same – a bit stiff, good tactile feedback and a bit short key travel. It also has red LED backlight, which isn’t as visible as it should be, but it will do the job just fine when it comes to typing or playing in a dark room. The touchpad is also pretty good, but a bit inconsistent at times. You can easily press it, but you have to make sure that you push it way down at the bottom corner to perform a left mouse click. This we didn’t like so much and the travel was somehow short. Nevertheless, you will easily get used to it. The Aspire VN7-791G is relatively easy to disassemble, but if it comes to a storage upgrade, you might find this rather difficult. You’ll need to remove all the screws at the bottom and then pop out the keyboard. Intel has developed a technology that can change the way we interact with computers and also modify the perception of the computers. They can actually have a better understanding of our surrounding. Implemented, this technology can be used from helping people with disabilities use the computer more easily to building self-flying drones. This technology is called RealSense and for now we can use it to expand our perception of the virtual reality thanks to the Intel RealSense 3D camera. Just like the 15-inch model, this one has Full HD, AH-IPS panel with WLED backlight manufactured by LG with a model number of LP173WF4 SPF1, but, of course, this time it’s 17.3″. It has matte finish and 16:9 aspect ratio leading to a pixel density of 127 PPI and space between each pixel of 0.199 x 0.199 mm. 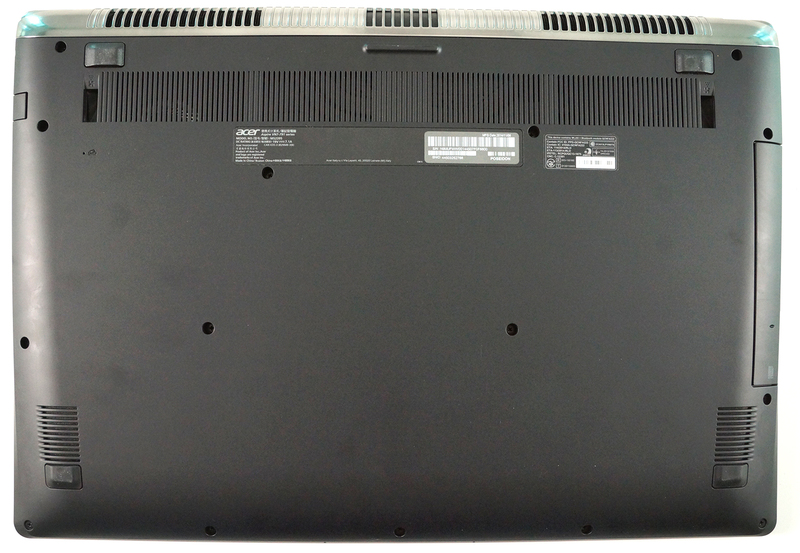 The manufacturer has listed this panel with a maximum brightness of 300 cd/m2 and contrast ratio of 700:1. We will make sure to check that out. Before we begin, here is a photo of the panel viewed with a microscope on a white background. Here is how the image quality changes when the screen is viewed at 45-degree angle. We measured the maximum brightness and it turned out to be 341 cd/m2 which is slightly higher than the manufacturer claims. The maximum deviation is just 6% which is an excellent result. The measured color temperature is 6086K – colors appear to be a bit warmer than the standard 6500K (D65). You can see that two of the angles had a deviation that’s not neglectable. The panel covers 91% of the sRGB and 70% of the Adobre RGB color gamut. Only a small portion of the red and green will be missing from the WEB-based colors (sRGB). The tone response curve (gamma) has an insignificant deviation from the optimal one. We calibrated the display at maximum brightness and color temperature of 6500K (D65) and the measured contrast is 925:1 which is again slightly better than the manufacturer has listed. The average deviation (deltaE-1976) after calibration is 3.63. We checked the color accuracy with a second calibrator before creating a profile. For most gamers, colors will appear accurate and no further calibration is needed. After calibration we recorded the results you can see below. The color accuracy is really good and just a little bit more is needed for the panel to be used for professional photo and video editing. Just for the record, DeltaE should be equal or lower than 2.0. Acer Aspire V17’s display has plenty of good properties that make it suitable for gaming. It has accurate color reproduction, high contrast ratio and brightness, it covers a fairly good amount of the sRGB color gamut, and it has wide viewing angles due to the IPS technology. We would like to take a deeper look into the specs here. They might seem impressive, especially for the given price, but there is one thing that really bothers us. The 17-inch variant doesn’t offer anything that’s worth the extra weight and size, except the bigger screen. The Aspire Nitro V17 has the same battery, same storage options (M.2 SATA slot, + HDD/SSD 2.5″ slot and you can replace your optical drive with an additional HDD/SSD slot), and roughly the same amount of ports (the V17 has 4 USB ports, while the V15 has 3). It’s normal to expect that the bigger chassis will present an opportunity for an upgrade over the original version (maybe bigger battery or more storage options), but Acer has decided to keep that for themselves. So if you like this notebook, but a smaller screen size is an option for you, go for the 15-inch variant as it is more compact and lightweight. 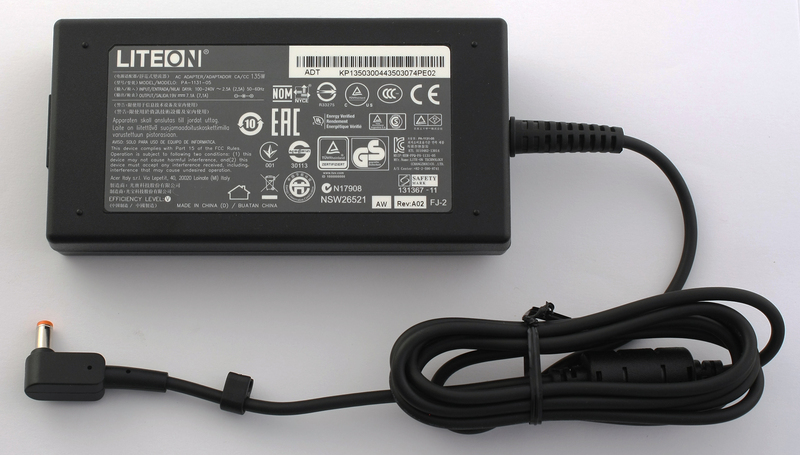 The battery presented in this laptop is the same as the one we found in the Acer Aspire V15 – 3-cell 4450 mAh. We can easily expect the same battery performance as we saw in the 15-inch variant, maybe even worse because of the big screen that the battery needs to light up. We performed series of battery tests – web browsing, video playback, and gaming, all of which share the same conditions – power saving mode is on, Wi-Fi on, Bluetooth off, and screen brightness is set to 120 cd/m2. Quite typical result for a gaming notebook – 225 minutes (3 hours and 45 minutes). Interestingly, a bit lower result than web browsing and the same thing occurred in the 15-inch variant – 200 minutes (3 hours and 20 minutes). This test got the most of the battery, since it’s the most demanding one – 92 minutes (1 hour and 32 minutes). Yes, we know that this is a gaming machine and it’s not intended for gaming on battery, but fo evaluation reasons we run these sorts of tests. The chip is equipped with 256KB of first level cache, 1MB of second level cache, and 6MB of third level cache. The Core i7-4710HQ has been developed using a 22nm process, allowing for the integration of the Intel HD Graphics 4600 controller. It operates at a base frequency of 400MHz while Turbo Boost can increase that to 1200MHz. Power consumption of the whole SoC (System on a Chip) amounts to 47 watts with a maximum operating temperature of 100C. Fritz is a chess benchmark which tests the computing capabilities of the CPU with various chess moves. The Intel Core i7-4720HQ managed to get 12.535 million moves per second. For comparison, one of the most powerful PCs, Deep(er) Blue, was able to squeeze out 200 million moves per second. In 1997 Deep(er) Blue even beat the famous Garry Kasparov with 3.5 to 2.5. NVIDIA GeForce GTX 860M, codenamed “N15P-GX”, is a high-end graphics chip, announced in late Q1 of 2014. It will be available in two models. The first one is part of the Maxwell architectural generation and relies on a GM107 core, constructed through a 28nm process. It consists of five shader blocks, known as SMM, and each of those has 128 smaller shader cores, also known as CUDA, for a total of 640 CUDA cores. The package also includes 40 texture cores and 16 raster cores. All of them operate at 1029MHz, but NVIDIA’s GPU Boost 2.0 can dynamically increase that frequency. The second one is part of the Kepler generation and relies on a GK104 core, constructed through a 28nm process. It consists of six shader blocks, known as SMX, and each of those has 192 CUDA cores, for a total of 1520 CUDA, and of course, there are the additional 32 texture cores and 16 raster cores. They clock at 797MHz and GPU Boost 2.0 is available here as well. Both have a 128bit bus and GDDR5 memory. NVIDIA GeForce GTX 860M supports DirectX 11.2, Pixel Shader 5.0, Optimus, SLI, PhysX, OpenCL 1.1, OpenGL 4.4, DirectCompute, CUDA, Blu-Ray 3D and 3D Vision. Memory bandwidth is 80.2GB/sec. Max resolutions (WxH) are 3840×2160 digital and 2048×1536 analog. All gaming tests were performed with the latest NVIDIA drivers and in our case (350.12 WHQL). For starters, we use a software to simulate a maximum CPU load of 100% and see how the system handles the extra temperature and see if any throttling occurs. We do this to check the overall system stability and reliability in the long run. We keep this test running for at least an hour or so and the Aspire VN-791G was able to to reach the maximum operating frequency of 3.3GHz (for 4 active cores) and slowly declined to 2.9 – 3.2GHz throughout the whole test. We can consider this as a good result, but the temperatures which the CPU kept were a bit worrying. The Core i7-4710HQ has been listed by Intel with a maximum operating temperature of 100°C and the CPU maintained temperatures from 89 to 95°C which is dangerously close to the maximum allowed temperature. 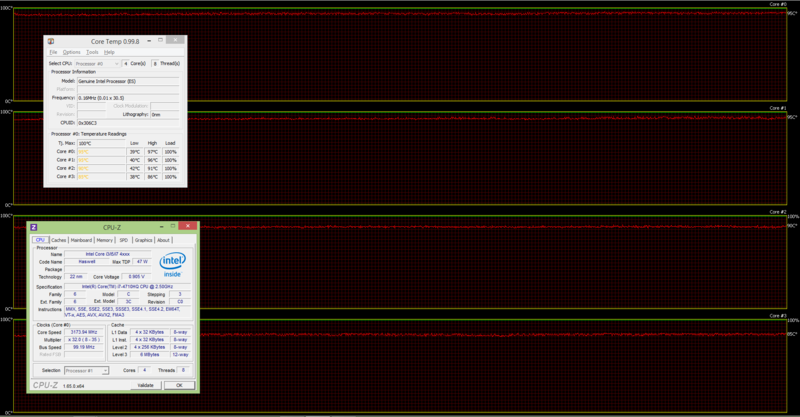 At least no throttling occurred and you can see the CPU load (the green line) and temperatures (red line) on the graph below. After an hour of CPU torture tests we added 100% GPU load for several reasons. Firstly, it will be good to see if the CPU and GPU share the heat and if they do, this will result in CPU throttling or even system shutdown due to higher temperatures of the CPU. Secondly, this will determine more accurately how the inner temperature affects the outer chassis and thus, user experience. During the tests, the GPU maintained relatively high temperatures – 86-88°C and the CPU also gained a few digits regarding the temperature – it stayed at 95-96°C which is still close to the maximum operating temperature of 100°C. Unfortunately, throttling occurred and the CPU began to run at 1.8 – 2.2GHz which is far from the 2.5GHz base clock. This might be due to the extra heat on the cores. 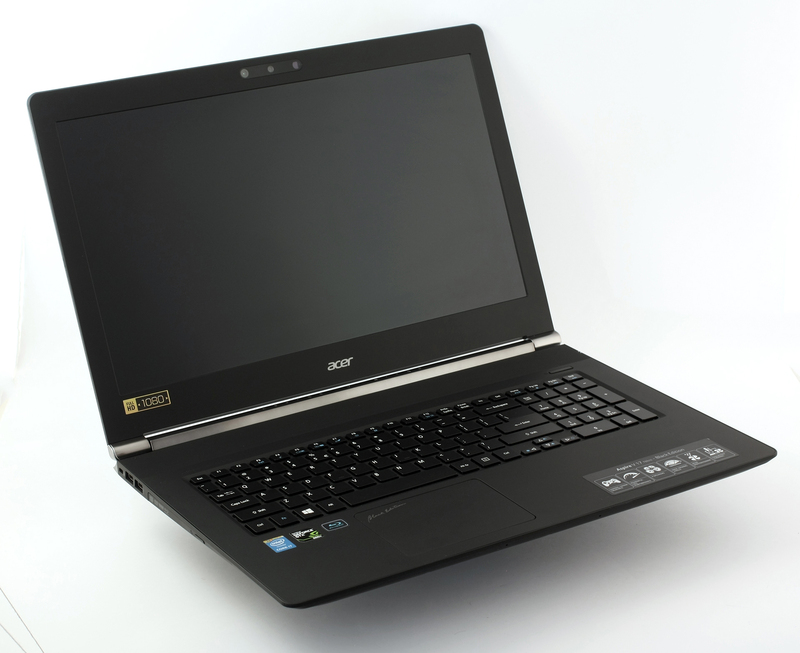 The Acer Aspire V17 Nitro Black Edition (VN7-791G) is just as good as its little brother. 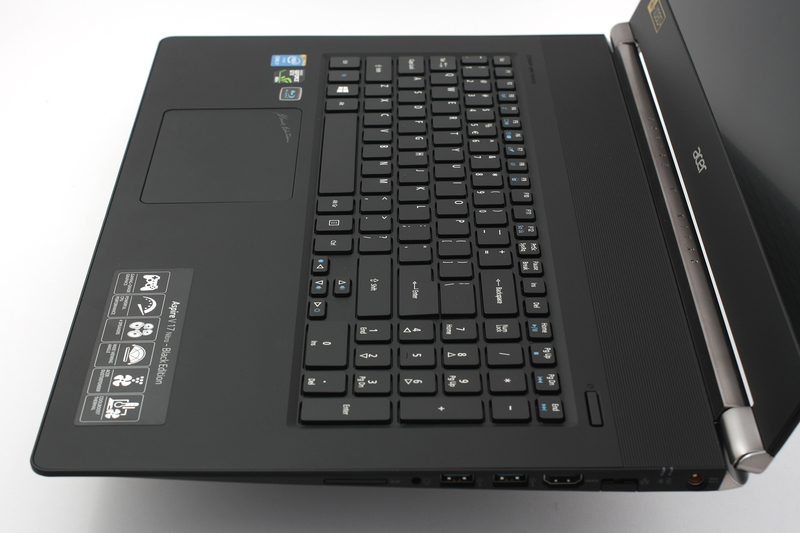 It has the same premium build quality, thin profile and powerful hardware. The screen is almost the same with just a little bump in the size. The interior is just as comfortable – good keyboard, nice, but sometimes inconsistent touchpad, and red LED backlight. We did notice, however, that the lid bends easily under small pressure due to the fact that the hinges are placed apart and the middle of the screen stands unsupported. Although, this is a minor issue that most people will not even notice. Spec-wise, this machine is a beast and it’s really cheap too, but fails to bring the desired upgrade to the table. The 15-inch variant is good, but the 17-inch variant should be better, due to the extra space inside the chassis. Unfortunately, this is not the case here as Acer didn’t upgrade neither the battery, nor the storage options. So unless you are 100% sure that you want a 17-inch laptop, we strongly suggest sticking with the 15-incher. I find it hard to understand how it did so poorly in the stress test giving the fact that even his ‘little’ brother did better. Do you have any speculation as to how can that be? i mean he has a bigger chassis and at least the same fan size..i’m puzzled by this. It looks like the test with the 15″ laptop had a 960M and a 4720HQ processor instead of 860M and 4710H in the 17″. When on battery power only, will the NVIDIA 860M graphics performance run at maximum for hi end games, or does that only happen if the PSU is plugged in? What about PWM for this model? Can u advise on the intel audio dsp funtions as wondering how the control it. and the surround sound effects..